BEIJING, June 9 (Yonhap) -- Singapore's Minister for Foreign Affairs Vivian Balakrishnan arrived in Beijing on Saturday after visiting Pyongyang to discuss details about North Korean leader Kim Jong-un's imminent visit to the country for a historic summit with U.S. President Donald Trump. After he arrived at Beijing International Airport, Balakrishnan was escorted away in a vehicle prepared by the Singaporean Embassy, avoiding contact with the media. He left for Pyongyang on Thursday for a two-day trip to discuss logistics, security and other details of the June 12 summit with his North Korean counterpart Ri Yong-ho. 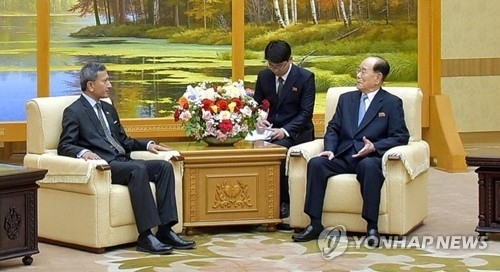 While visiting the North, he also met with Kim Yong-nam, the nominal head of state. Which airline Kim Jong-un will use and which route the plane will take to the summit venue might have also been discussed. The visit seems to have been made to "fine-tune the last details about diplomatic protocol and security issues to host Kim Jong-un," a source in Beijing said. Balakrishnan is expected to return to Singapore later in the day.